WHOOPING COUGH EPIDEMIC MAY BE WORST IN 50 YEARS. Compound found in red wine neutralizes toxicity of proteins related to Alzheimer’s. Put Yourself in the WC Cost Driver Seat! It’s just not true talking about the ins and outs of workers’ comp encourages employees to file claims. In fact, the employer’s workers’ comp costs are lower the more a company communicates with their injured employees. Communication is part of an employer’s multi-level strategy of communication with everyone –employees, doctors, TPA, and broker. It may include video messages from the president, sample weekly meeting guidelines for workers’ comp coordinators to use, and forms for injured employees to complete. A get-well card is an example of giving a message in an informal way. In the card you could include a $20 gift card for pizza. Such a gesture communicates to your injured worker your awareness that the whole family is suffering with the mom/dad out of work, and getting a pizza is a nice thing to do for the whole family. It sends a clear message that the employer cares about the family. Author Rebecca Shafer, J.D., President, Amaxx Risks Solutions, Inc. has worked successfully for 20 years with many industries to reduce Workers’ Compensation costs, including airlines, healthcare, manufacturing, printing/publishing, pharmaceuticals, retail, hospitality and manufacturing. Contact: RShafer@ReduceYourWorkersComp.com or 860-553-6604. Here’s two announcements involving quick, inexpensive tests; one for blood type and the other is an easy, inexpensive test for pesticide content in foods. Their study on the test, which involves placing a drop of blood on a specially treated paper strip, appears in ACS’ journal Analytical Chemistry, where the authors say it could be a boon to health care in developing countries. The test also could be useful in veterinary medicine, for typing animals’ blood in the field, they note. Gil Garnier and colleagues explain that determining a patient’s blood type is critical for successful blood transfusions, which save millions of lives each year worldwide. There are four main blood types: A, B, AB, and O. Use of the wrong blood type in a patient can be fatal. Current methods for determining blood type require the use of sophisticated instruments that are not available in many poor parts of the world. An inexpensive portable test could solve that problem. The scientists describe development of prototype paper test strips impregnated with antibodies to the antigens on red blood cells that determine blood type. In lab tests using blood samples from human volunteers, the scientists showed that a drop of blood placed on the strip caused a color change that indicated blood type. The results were as accurate as conventional blood typing. “The paper diagnostics manufacturing cost is a few pennies per test and can promote health in developing countries,” the report notes. Story Source:The above story is reprinted (with editorial adaptations by ScienceDaily staff) from materials provided by American Chemical Society. Scientists in Canada are reporting the development of a fast, inexpensive “dipstick” test to identify small amounts of pesticides that may exist in foods and beverages. Their paper-strip test is more practical than conventional pesticide tests, producing results in minutes rather than hours by means of an easy-to-read color-change, they say. The study is in the November 1 issue of ACS’ Analytical Chemistry, a semi-monthly journal. John Brennan and colleagues note in the new study that conventional tests for detecting pesticides tend to use expensive and complex equipment and in some cases can take several hours to produce results. They cite a growing need for cheaper, more convenient, and more eco-friendly tests for pesticides, particularly in the food industry. 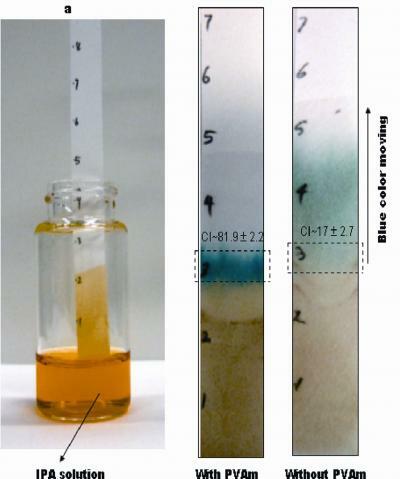 The scientists describe the development of a new paper-based test strip that changes color shades depending on the amount of pesticide present. In laboratory studies using food and beverage samples intentionally contaminated with common pesticides, the test strips accurately identified minute amounts of pesticides. The test strips, which produced results in less than 5 minutes, could be particularly useful in developing countries or remote areas that may lack access to expensive testing equipment and electricity, they note.